Here is how I can tell when I've been reading Zero Hedge too much. I find myself rolling my eyes at CNBC or the Wall Street Journal while saying things like "There's more to it than that!" or "Suuuure, it may seem that way." I know Canadian equity strategist David Rosenberg's latest perma-bearish musings, and the same from the preternaturally gloomy Albert Edwards of Société Générale. After prolonged exposure, I have to turn off my wi-fi not to sell all my U.S. dollars for physical gold, start an antiGoldman Sachs blog and buy a Kansas soybean farm protected by a moat. 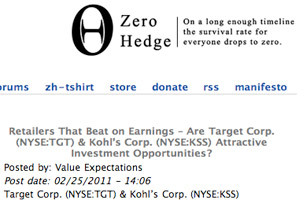 But here is the crazy thing: Zero Hedge  a morning zoo of pessimistic financial blogging  is fun. Granted, you (O.K., I) can't read it for long without the aforementioned soybean-farmer effect, but the downbeat site has found an entertaining niche at the intersection of The X-Files, finance and tireless antiGoldman Sachsishness. So while I don't read Zero Hedge regularly  it's too bearish, too conspiratorial and too much of an intellectual monoculture  I like knowing that it exists. Any time I'm feeling like things might just turn out O.K. on planet Economic Earth, I know where to turn to be disabused of that stupid idea. Kedrosky is a columnist for Bloomberg and the author of the blogs Infectious Greed and Paul Kedrosky on Bloomberg.com.